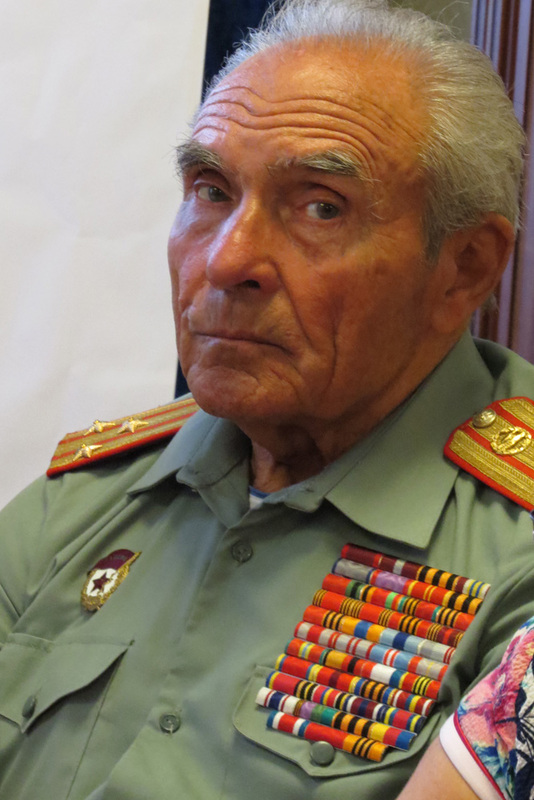 The event brought together members of a U.S. peace delegation sponsored by the Center for Citizen Initiatives (CCI) and Soviet-era Russian World War II veterans. Both groups had gathered around a conference table on the previous day; the Americans heard the WWII vets speak fondly of the period when Russia (the then-Soviet Union) and the U.S. were united as allies against fascism; both sides shared the conviction that a peaceful, productive relationship between both countries could and should exist again. Before the meeting concluded, the Americans invited the Russian vets to join them in the waters of the Black Sea for a “Swim for Peace.” But when the U.S. side first proposed the idea, it wasn’t clear whether the solemn and dignified Soviet-era officers — some of whom seemed unapproachable in their stiff military uniforms complete with medals, ribbons and other war regalia — would take the invitation to heart. Nevertheless, on the following afternoon, the war vets turned out in their swimming trunks, enthusiastically plunging into the waves with their U.S. counterparts in a demonstration of true “swimsuit diplomacy.” They were soon joined by other citizens of Yalta — including one of the town’s officials — all of whom seemed to revel in the spirit of goodwill that permeated the event. Meanwhile, cameras rolled, and the “Swim for Peace” aired on Russian television. However, in the days following the event, there was no pickup of the event seen in U.S. or Western media. Despite the existence of punitive U.S. and European Union sanctions on Crimea that have crippled the local tourism industry and harmed local businesses – for example, the Crimean resort town of Yalta normally bustles with European cruise ships in summer, but there were none to be seen last year because of U.S.-imposed travel sanctions – Yalta showed warm hospitality to the American guests: When the swimmers reached shore, they were ushered to an outdoor reception featuring platters of fresh fruit all grown locally in the Crimea including raspberries, strawberries and other delicacies — and glasses were raised to peaceful U.S.-Russia ties with wine made from locally cultivated grapes. Despite the U.S. government’s sanctions regimen that has harmed many productive Russian-American exchange programs at the cultural, social, political and diplomatic levels, ordinary Russian people have clearly and strongly expressed the desire to live in peaceful coexistence with the United States — a sentiment that was expressed to the U.S. delegation not only in the Crimea, but in other regions of Russia, as documented by CCI delegation member and former U.S. diplomat Ann Wright. 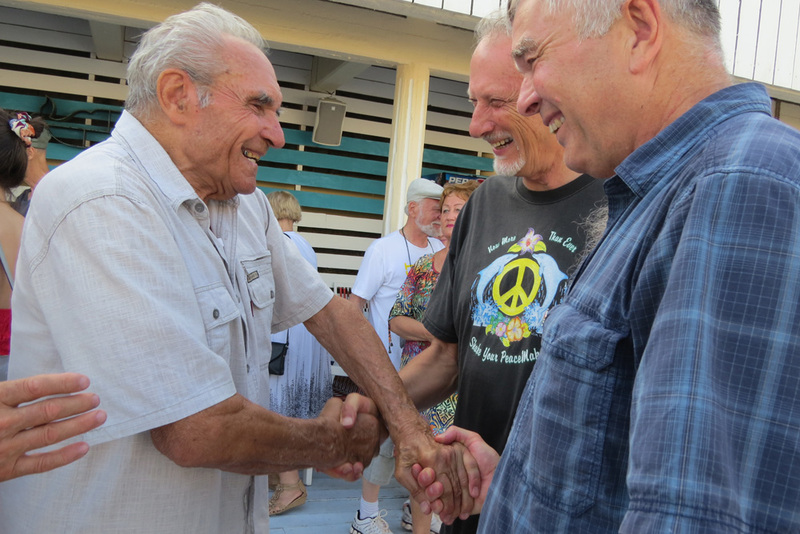 In gamely joining U.S. citizens in a “Swim for Peace,” the citizens of Yalta demonstrated a level of goodwill and friendship that could be the basis for developing a strong grassroots movement for peace between Russian and U.S. citizens. It is my sincere hope that the “Swim for Peace” becomes an annual tradition between Russians and Americans — not only in Yalta, but in other Russian and U.S. seaside towns that are willing to welcome delegations of Russians and Americans who believe in the possibility of peace between our two peoples and nations. Small gestures of goodwill can yield lasting results. That Yalta — which suffers disproportionately from the impact of U.S. sanctions against Russia — has chosen to honor a former U.S. president at a time of stress and tension between Russia and the United States — and which engaged a visiting U.S. delegation in a “Swim for Peace” — should give U.S. citizens pause in the U.S. media’s unrelenting hostility toward Russia. Has the monument honoring FDR at Yalta and the “Swim for Peace” been reported in U.S. mainstream media? If not, why not? Would a U.S. city ever consider making a similar reciprocal gesture to Russian citizens or a Russian leader? If Americans could learn about goodwill gestures by Russian people who believe in the possibility of peaceful coexistence, they might be less likely to allow their government to launch a war that could lead to the use of nuclear weapons.